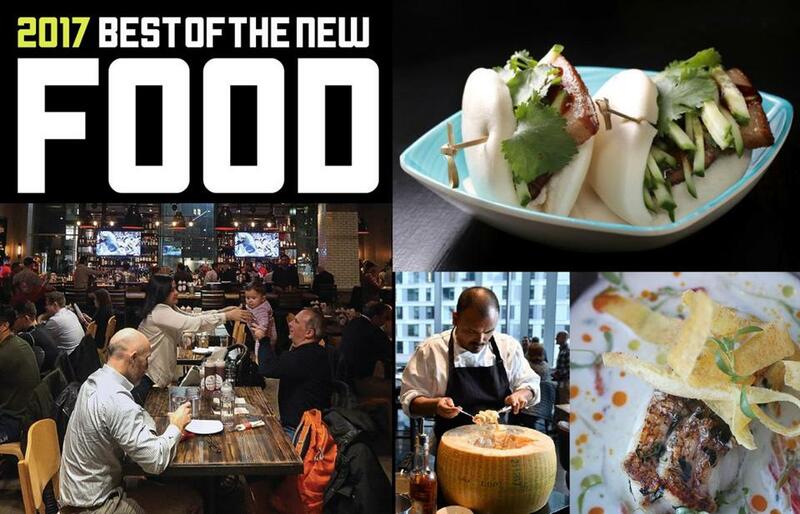 Dozens of picks for any budget, including pitch-perfect Italian-American cuisine, Chinese eateries, seafood and lunch spots, and more. You’re listening to Frank Sinatra or greatest hits from your favorite operas, dining on marble-topped tables with windows that open onto Hanover Street. 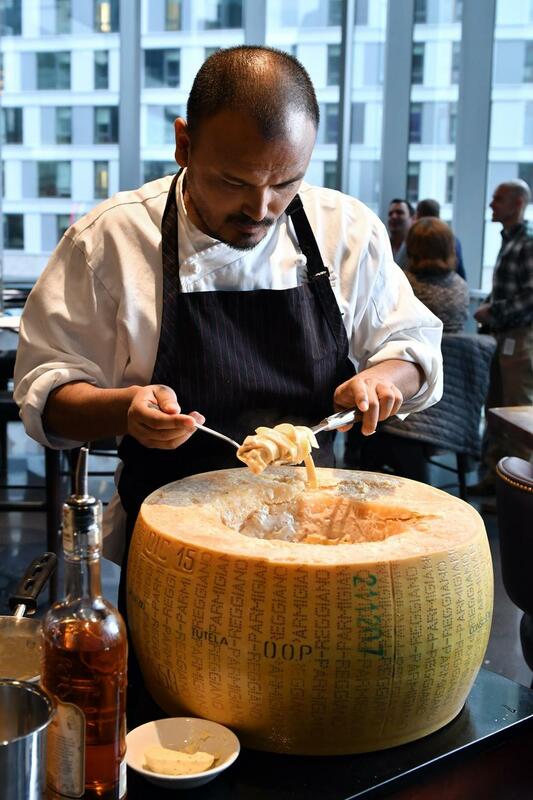 Waiters come around with big hunks of Parmesan to grate onto your pasta, which is served in huge portions. It’s everything you want in a North End restaurant. Bencotto is Italian for “well cooked,” which the pizzas mostly are. The menu is pitch-perfect Italian-American: shrimp scampi with linguine, grilled sausages with roasted peppers, fried calamari with hot cherry peppers. Your relatives visiting from out of town will love it. The staff gets you in and out quickly. Big plus: You can reserve. Vacationland denizens swear by the enormous lobster rolls and steak-and-cheese subs at Bennett’s, a seasonal pit stop minutes from the Kennebunk beaches. Now the beloved sandwich slinger has a year-round Boston branch. This is happy news for folks looking for a down-home break from the Fenway’s glitzier options. No frills here, just meaty lobster swirled with traces of mayo and drawn butter. Service is fast and friendly. The urge to eat dumplings is strong. But a trip to Chinatown isn’t always in the cards. How nice, then, to have Bess’s Cafe in Brookline. Named for operator Bess Lee, the tiny restaurant turns out homey noodle dishes (dan dan noodles, pork belly noodle soup), scallion-pancake wraps filled with beef, and crispy chicken buns. 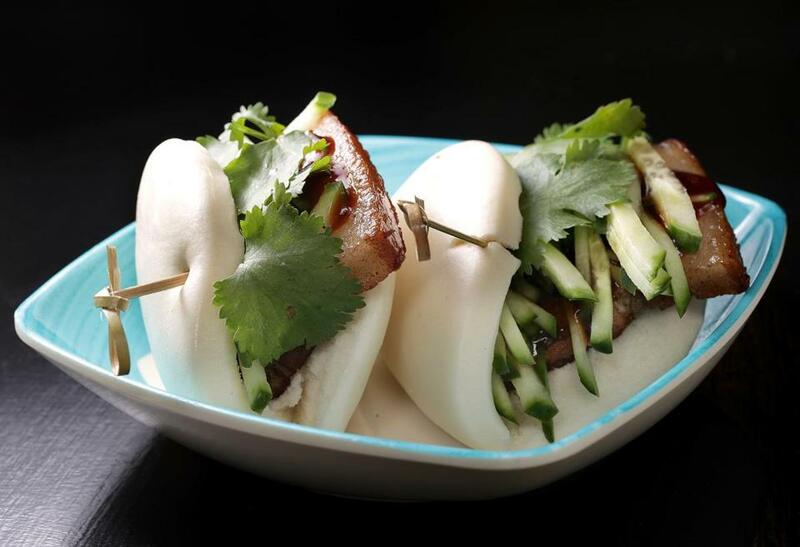 But its specialty is handmade dumplings, toothsome, carefully pleated wrappers filled with shrimp, pork and chive, and more. In wonton soup, they’re a surefire way to fight the wintry cold. For years, locals clinked glasses at Flora, a mainstay in the majestic Arlington Five Cents Savings Bank building. It’s now home to the lovely Bistro Duet — a warm, stately French restaurant with live music, chatty service, and solid renditions of classics like coq au vin and moules frites. Niceties like a “dinner and show” package with the nearby Regent Theatre and a three-course, $28 early prix-fixe menu make this a good bet for a neighborly, welcoming evening out in an area short on special-occasion destinations. This Washington Square newcomer is the little sibling to Somerville’s Painted Burro, a wee Mexican restaurant bursting with bright colors and flavors. Nachos, queso fundido, and more get modernized — think roasted beets with tomatillo vinaigrette and goat cheese croquetas, crispy coconut cod tacos, and pork enchiladas with red wine and cola mole. The whole neighborhood piles in to sample all manner of margaritas and an intriguing tequila selection, and the night becomes a party. We’ve watched chef Jason Santos’s career evolve, from Gargoyles on the Square to Blue Inc. to Abby Lane to Citrus & Salt (see box at right). With New Orleans-influenced Buttermilk & Bourbon, the former Hell’s Kitchen contestant seems to have entered a new phase — one where he’s ready to have some fun. The menu encompasses honey-glazed biscuits, crawfish and lump crab soup with absinthe, BBQ shrimp, and fried chicken. Drink cocktails by black light in the Voodoo Lounge and let the good times roll. We dream of long weekends in Montreal — so close — and yet our local restaurants neglect the rich fare of Quebec. No more. The team behind State Park and Mamaleh’s quietly opened this cozy restaurant in the Kendall Square space where it once ran Hungry Mother. It’s a worthy French-Canadian successor to that French-Southern hybrid, showcasing ingredients and dishes from maple syrup to pork pate (cretons) to the meat pie tourtiere, with pork and venison. Yes, of course there’s poutine — but the real reason to visit is for showstoppers like the perfectly cooked half duck with sunchoke puree, along with smashing cocktails and a well-assembled wine list. Beverly Hills meets the Back Bay in this loud coral-and-gold room presided over by madcap chef Jason Santos. With Buttermilk & Bourbon (see entry at left), Santos took on New Orleans. Here he tackles coastal Mexican cuisine with surprise touches, like blowfish tails and almond jam or crab tostadas showered with fried leeks. Bracing cocktails are just as wacky — Take Your Pants Off, Tears & Tequila — and best consumed in the low-lit Garden of Santeria in the back, with backlit murals and spongy sofas. Bachelorette gaggles and boozy thirtysomething birthday revelers, you have found your new oasis. Chef Mary Dumont, formerly of Harvest, branches out with her own restaurant in the Ames Boston Hotel. She’s brought a deep bench of local purveyors with her; the restaurant, adjacent to City Hall, also has a hydroponic garden. The resulting seasonal cuisine draws on a regional array — sweet potatoes, chestnuts, and venison are among the ingredients taking center stage at the moment. Handmade pastas are a highlight, along with a fun bar menu. A roster of ambitious desserts rounds out the meal. Posh condos. Waterfront restaurants. East Boston is gentrifying fast, and Cunard Tavern is a symbol of the new Eastie. Tots in strollers, college pals cramming the bar, suited dudes with suitcases grabbing beers before heading off to Logan — they crowd this people-pleasing Jeffries Point pub for wings, steak frites, and pan-seared scallops. The service is fast, the food is reliable, and in warm weather, the windows open to the street; the water’s just a few blocks away. In with the new. The beloved Portland oyster institution has come to Boston, and the city rejoices. All the favorites are at your fingertips, from sparkling-fresh bivalves to tuna crudo to the cult-following-worthy brown-butter lobster roll on a steamed bao-style bun. 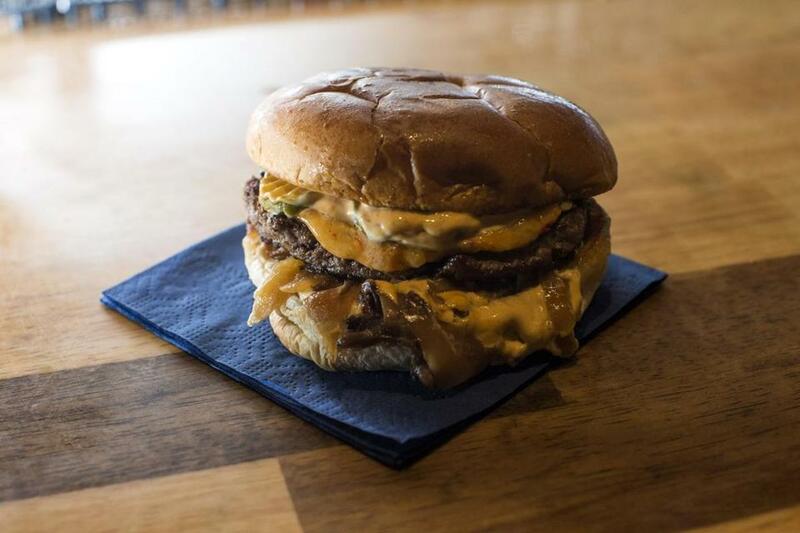 And those who don’t do seafood aren’t left in the lurch: The burger is like a Big Mac for food snobs. Eventide Fenway takes fast-casual form, which makes it particularly well suited for game-day visits. On the first floor of a historic Masonic lodge across the street from Boston Common, the latest effort from Big Night Entertainment Group (Red Lantern, Gem) is the day-into-night cafe-restaurant this part of town needed. Beautifully decorated and spacious, Explorateur keeps hours as commodious as its free Wi-Fi and communal tables with outlets. If the gorgeous work/study space and La Colombe coffee aren’t enough of a draw, check out the French fare, such as moules marinieres, steak frites, and roast chicken for two. In the Union Square space that used to be Journeyman, and in many ways its spiritual successor, Field & Vine is run by chef Andrew Brady and Sara Markey, partners in work and life; the food is seasonal, sustainable, and ingredient-driven. In a space that looks the creation of a woodland elf turned celebrity chef — branches festooned with twinkling lights, hanging bunches of herbs and garlic, an open kitchen — Brady turns out hakurei turnips with ham and cranberries, fried smelts in spicy tomato sauce, sausage with heirloom beans and charred cabbage, and more. At this bistro that makes the South End feel like France, the wine flows as readily as the neighborly hospitality. It comes from Sandrine Rossi, whose family owns a winery in Bordeaux, and Loic Le Garrec, who presided over the Petit Robert restaurants for years. The menu hits touchstones such as onion soup, foie gras, coq au vin, and steak frites, along with shishito peppers, kale salad, and other pleasant diversions. Open from late morning to late evening, Frenchie is a new reliable. Baby, it’s warm inside. 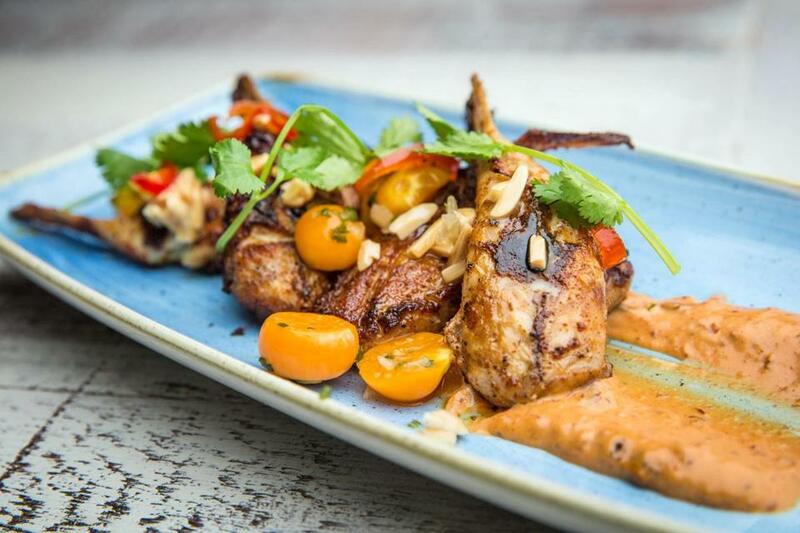 This nightclub and restaurant from the owners of Merengue and Vejigantes offers live jazz and Caribbean food — from empanadas filled with goat cheese and tomato marmalade to seafood-and-rice soup to an impressive fried whole red snapper with tomato-coconut sauce. For a feast, order a whole roast pig in advance. Chef Giovanna Huyke has been referred to as “the Julia Child of Puerto Rico.” A night here spirits you away from Central Square to somewhere balmy and relaxed. This Harvard Square winner comes from the team that operates Eastern Standard and Island Creek Oyster Bar, and it feels like a cross between the two. Making the most of chef Jeremy Sewall’s connections with the local fishing community, French-influenced Les Sablons documents the changing of the seasons in preparations such as baked oysters with smoked uni butter, chicken consomme with truffle tortellini, and veal boudin blanc with potato puree and roasted apple. As elegant and appealing as the food is, what really makes the restaurant memorable is the crack hospitality. The closest Cambridge — specifically, Inman Square — gets to Tokyo’s tiny watering holes, Momi Nonmi is what happens when an accomplished chef (Chris Chung, formerly of Uni and AKA Bistro) and a sake expert (Stephen Connolly, who also worked at Uni) join forces to create an izakaya, or Japanese-style gastropub. The menu draws on Chung’s sashimi acumen, along with dishes from his Hawaiian childhood such as poke and the burger-on-rice dish loco moco). Meanwhile, Connolly’s behind the bar, pouring and dropping knowledge about sake and Japanese whiskey. Just about everything on the menu also happens to be gluten-free. Urban carnivores pack this Back Bay meat emporium, a spinoff of the Waltham original, known for charcuterie and sandwiches. Enjoy husky stacks of salami or pork belly washed down with cream soda, or take a loaf of pate or a carton of sauerkraut to go. Lines get long at midday, but staffers circle the frenzied waiting area with trays of thinly sliced meats for snacking — a civilized touch. Seafood-focused restaurants have swept the city, and now this corner on the edge of the Back Bay has one too. Mooncusser showcases the talents of chef Carolyn Johnson (80 Thoreau) in an upstairs-downstairs scenario. On the ground floor is Moon Bar, which serves lobster rolls, smoked bluefish fattoush, and other casual dishes. The upstairs space offers city views and upscale fare, from turnip soup with poached oysters and pear cream to stuffed skate with lobster and chard, along with a tasting menu of local fish. This North Cambridge cafe seems straight out of a Goop ad: tranquil blue walls, long benches, moms with babies strapped to their chests sipping espresso fizzes, a mellow soul soundtrack. The coffee is strong, but thanks to owner Robert Harris — the mastermind behind nearby Season to Taste — the food is even better. Indulge with exceptional popovers or house-made bread (get yours draped with cold-smoked salmon or caramelized peaches), egg dishes like a trout and sorrel omelet, and a thoughtful dinner menu spotlighting pumpkin ravioli and pork sausage with maple mole. The whole place feels like a warm designer hug. There may be no more charming corner of the city in which to demolish an assortment of local oysters, with assorted sauces or in gorgeous little landscapes composed on the half shell: with quail yolk, litchee pearls, and Chartreuse jelly; watermelon pearls, rose, and creme fraiche; or hibiscus ponzu and lemon verbena. But there’s much more than oysters at this bright, tiled North End seafood spot. Chef Douglas Rodrigues’s food is at turns elegant and cheeky, from salmon crudo with Chinese hot mustard to lobster and oxtail Bolognese to lobster rolls served hot or cold. Old-school deli, meet new-school deli. The folks who run Citizen Public House, the Franklin Cafe, and Tasty Burger are behind Our Fathers, which specializes in hand-cut pastrami and corned beef, piled onto rye with mustard, pickle on the side. The restaurant menu also offers dishes that unite Jewish, Israeli, and modern American cuisine. Along with matzo ball soup and potato pancakes, you’ll find hummus with various salads, bourekas, spice-rubbed lamb spare ribs, and challah-wrapped cod in coconut curry. At the bar, gin drinks are the focus; there’s a takeout counter, too. Do we really need another Italian-inspired trattoria? We do when it’s this good. A fire crackles in the white-tiled fireplace as a statue of the harvest goddess Demeter looks out over the room: Cantabrigians are contentedly consuming foie gras torchon, pork chop with pancetta dashi, and chef Chris Willis’s beautiful handmade pasta dishes, such as lumache with Bolognese and gochujang. A quintessential neighborhood restaurant that might make you want to move to this neighborhood, between Central and Harvard squares. The team behind Steel & Rye in Milton branches out to deliver just what Coolidge Corner needed. 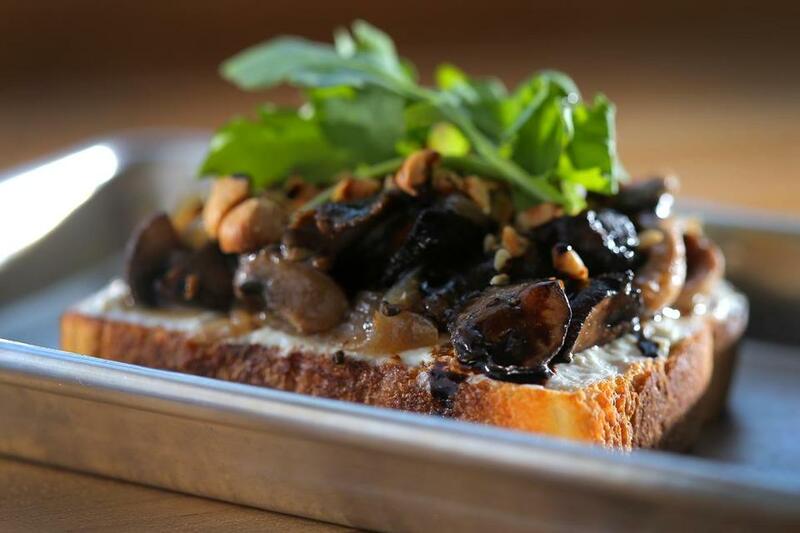 In the prime location that used to be Lineage, Prairie Fire puts its wood oven to good use, cooking oysters, vegetables, and especially blistered, crisp-edged pizza, topped with mushrooms, kale, and roasted leeks; fennel sausage, tomato, and cheese; and more. Come for the pizza, salads, and pastas; stay for the warm atmosphere and knowledgeable service. You’ll feel as though you’re aboard an ocean liner in this expansive harborside retreat, tucked into a swanky East Boston luxury tower, with an opening made buzzier by the presence of former Pigalle chef Marc Orfaly. Old salts, young sprites, and everyone in between settle onto captain’s chairs to hoist wine glasses, nibble oysters and grilled calamari, and take in the delicious patio view. On a warm summer’s night, with a sunset the color of white wine, there’s no nicer place to be. Grilled cheese and arcade games — what’s not to love? Roxy’s Grilled Cheese joined forces with Area Four to bring this boozy adult playground to Central Square, and the result is pure joy. Drink cocktails from sippy cups, watch sitcoms on big-screen TVs, and play vintage games like Mortal Kombat II, all while sucking down cheese dogs, cheese fries, and rib melts doused in — what else? — cheese. In a restaurant world that sometimes takes itself too seriously, this is a happy reminder that dining out can be just plain fun. 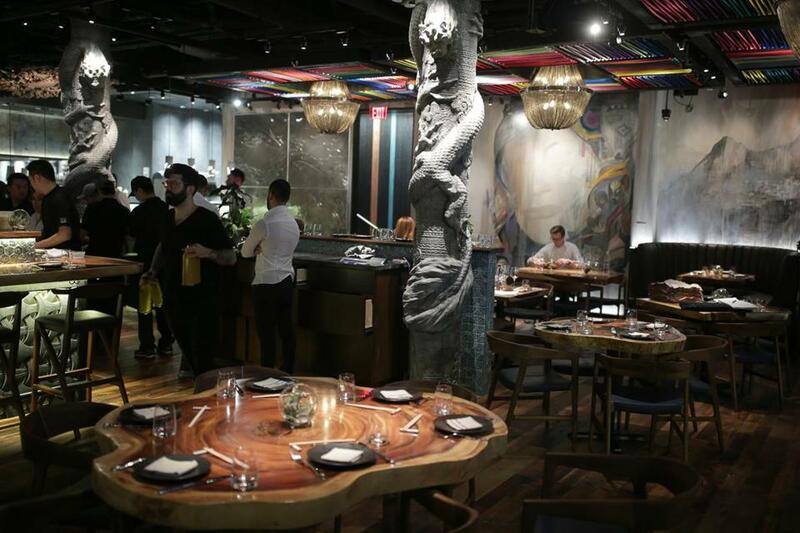 Downtown Crossing is on the culinary map once more, and nowhere is that more apparent than at Ruka, a lively joint for the Peruvian-Asian fusion cuisine known as Nikkei. Located in the Godfrey Hotel Boston, it’s under the same management as Locke-Ober replacement Yvonne’s. 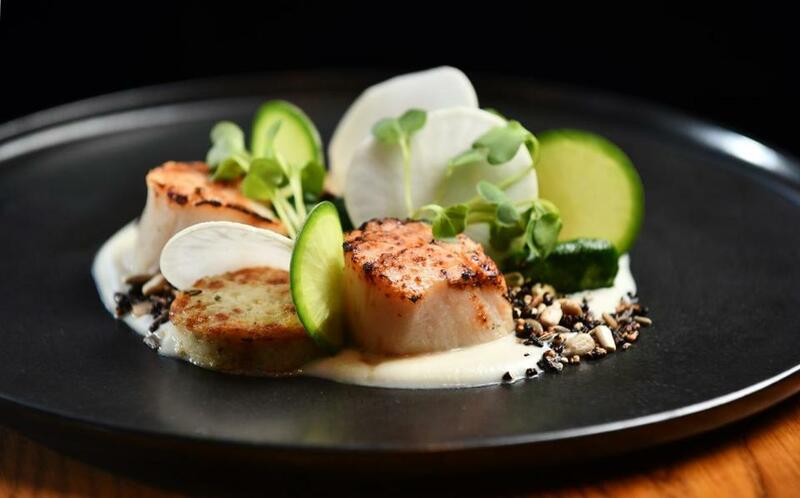 A few years ago, who would have thought that you could enjoy whole crispy Japanese butterfish and blackened octopus in Filene’s Basement territory? The vibe is slinky, the music is thumping, and the drinks are strong. There’s a solid sushi program, too. Walk up a narrow flight of stairs, leave the Chinatown bustle behind, and enter a happy little noodle parlor with surreal murals (are those chopsticks jumping off the walls?) and satisfied slurpers devouring some of the quirkiest ramen in town, topped with “swag” — house parlance for extras — like fried chicken and grilled corn. In a hurry? Grab an out-there snack like a dirty bird salad with grilled chicken thighs and charred tomatoes. Fast-casual Ruckus is from the folks behind the excellent Best Little Restaurant and Shojo, so the food quality matches the ambience. From the team that ran Santa Banta in Waltham comes Singh Saab in Arlington Center, with food from the Punjab, in northern India. With father and son Surinder Singh and Rajwant Singh in the kitchen, puffy, chewy, lightly charred nan is as delicious as it was at Santa Banta. Even a simple vegetarian dish like chana masala — chickpeas with tomatoes — is simmered in an intense, aromatic sauce. There are tandoor dishes, several biryani entrees, and a handful of Indo-Chinese specialties. Rajwant Singh also owns Singh Ching in Burlington, which offers a similar menu. What the Boston area needs is a Spoke Wine Bar in every neighborhood. The Davis Square stalwart is small — 12 tables and 13 barstools — with delightful small plates and adventurous, small-producer wines. Opened in 2013 by Felisha “Flea” Foster, who sold to a former bartender three years later because of serious health problems, the little spot reopened this year to an eager audience. 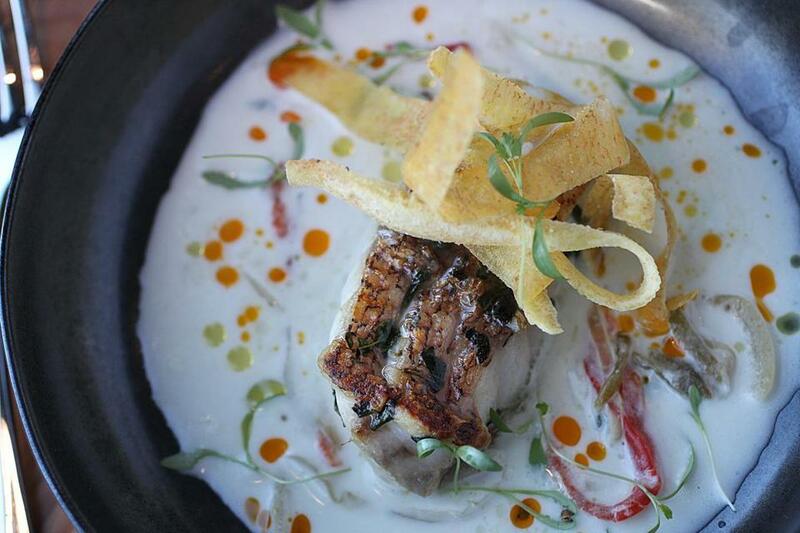 The chefs trained at top area kitchens, and the food is outstanding. Foster, who died in October, would be proud of this generation of ownership. Longtime Theatre District standby Troquet rises again in a new location near South Station. Executive chef Scott Hebert continues to create modern, seasonal dishes such as cold-smoked hiramasa crudo; butternut squash bisque with chicken confit; steamed turbot with fennel, shrimp, and red curry; and roast porcelet with maple mustard and quince. They go hand in hand with pairings from sommelier-owner Chris Campbell, whose wine list is as much of an attraction as ever. A casual bar menu offers pleasures like lobster avocado toast and a double burger with candied bacon. Expense-account dining might be making a comeback, but it’s also never been a better time to grab a quick bite, from healthy salads to spicy sandwiches. With this stylish fast-casual spot, first-time restaurateur Nina Festekjian draws on her Armenian and Lebanese heritage. 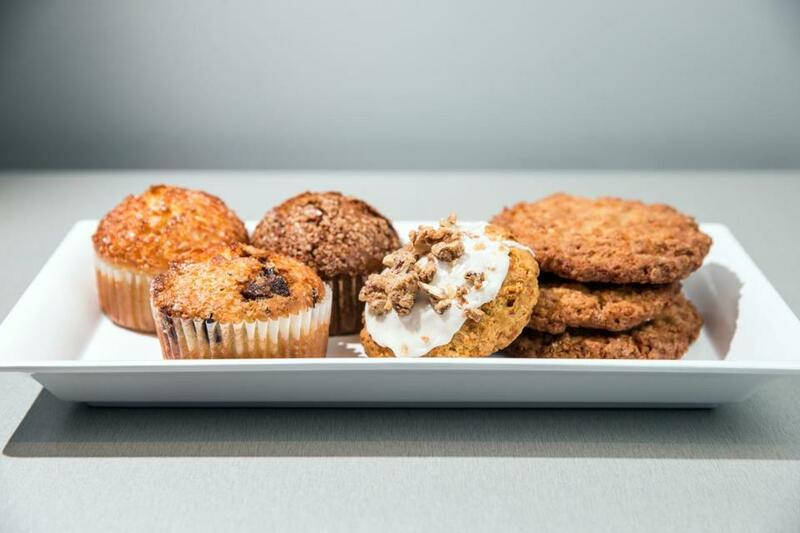 The result is a slam-dunk, offering food that is flavorful, healthy, and reasonably priced, not always the easiest thing to come by in the South End. The restaurant specializes in sandwiches toasted on a saj, or griddle; you’ll find everything from lentil kofta to za’atar chicken rolled in the flatbreads. There are also grain bowls, salads, and creations built on the strained yogurt labneh. “Anoush’ella” is an Armenian expression meaning “may it be sweet.” And indeed it is. Take your laptop to this Kendall Square cafe and work on your novel. It’s the kind of place that lets you while away the afternoon, perhaps on a cozy banquette, and never get tired of where you are. The gray color scheme is ideal for this light-filled space. The geometric figures on the ceiling are the molecular symbol for caffeine. The coffee’s good, the sandwiches pressed to a golden, melty goodness, and the brown-butter chocolate-chip cookies wonderful. The high-tech crowd uses Catalyst Cafe for small meetings, and Prada ladies use it to meet for coffee. Greek is the new Italian, and it works well in a fast-food setting. Jody Adams and her team are doing it at Saloniki Greek in the Fenway and Cambridge. So are Stefanos Ougrinis and partner Demetri Tsolakis (Committee and Cafeteria) in this light-filled basement on Newbury Street. Counter workers slice meat off gyros to tuck into thick, warm pita with a handful of fries. Rolled, they look like fat ice cream cones. These cooks are brilliant at combining juicy meats with salty components. Fries served on their own come sprinkled with feta and oregano — you’ll swoon. Zucchini chips are phenomenal. It’s crowded here, with just 18 seats. Go during off hours. A young woman at the door, dead serious, greets a visitor with “I’m your ambassador.” Take a deep breath while she explains the menu board, which isn’t that different from those at many other places that let you create your own grain bowl or salad. But this 20-plus-location Philly-based chain with branches in the Fenway and the Seaport does stir-fries, too. You order and pay on a screen. Among the salads, stir-fries, and “honeybar” — a fruit-honey-cream-topping bowl you build yourself — this well-organized operation has something more or less healthy for everyone. All bowl and dish combinations already on the menu have calorie counts. A Cobb salad is over 800. 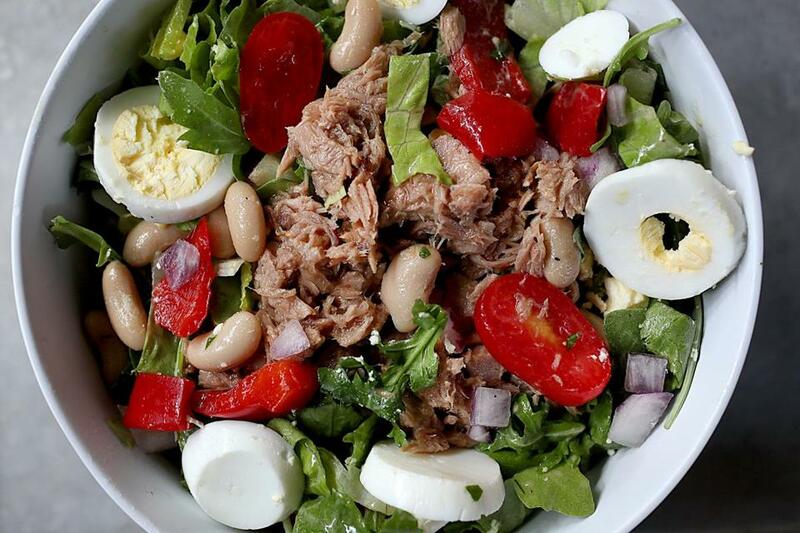 If that matters, you’re better off with white bean tuna (500). On second thought, we’d rather not know. Eataly and Wagamama are steps away, but neither comes close in value and quality to Num Pang, the Prudential Center location of a New York mini-chain. Flavors are Southeast Asian (“num pang” means “sandwich” in Khmer), adjusted for American tastes. But you get the full panoply of crisp textures, colorful vegetables, aromatic herbs, rice, and grains. Put together a bowl or get a bahn-mi-ish sandwich with chili mayo and a mountain of crispness tucked into crusty bread. In the Boston area, 2017 was the year of poke — Hawaiian raw fish salad served in bowls and sometimes wrapped up burrito-style. These establishments will get you hooked. Legal Sea Foods was late to the bowl concept — you know, choose a grain from this column, protein from the next column, then add-ons, dressing, and more — but as with all things, the chain does it well. Not exciting, but dependable and consistent, with every bit of seafood beautifully cooked and a well-trained staff on the cafeteria-style line, Legal Fish Bowl is adjacent to the Kendall Square Legal’s. With floor-to-ceiling windows that make it feel like a real fishbowl, it’s no place for an off-the-record conversation. The “signature bowls” have some too-cute names, such as Pick Your Hoisin — glazed salmon with charred broccoli (the vegetable of the moment), zucchini noodles, avocado, and Dijon dressing. Sometimes you don’t need excitement. 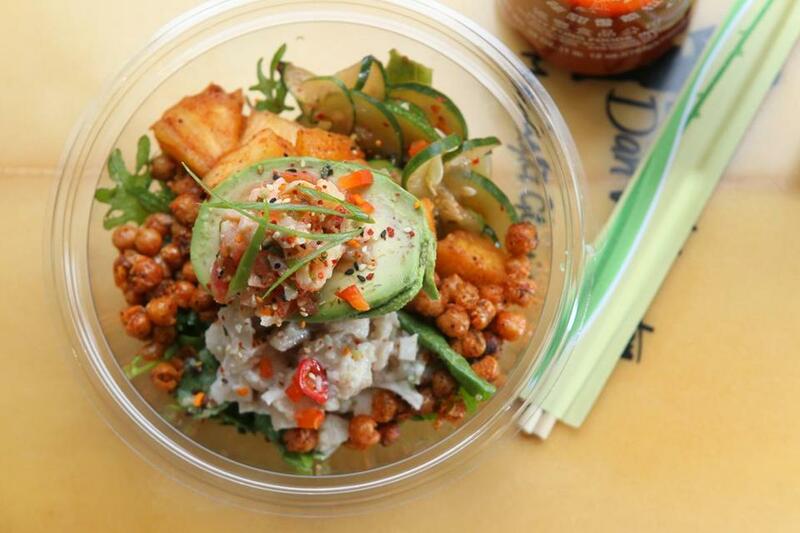 Stand-alone poke shops and mini-chains have popped up from the Back Bay to Davis Square, squeaky-clean and ultramodern, luring crowds eager for something more than sandwiches. Manoa, on the Somerville-Cambridge line, is a little different. Hidden on a tired block with a serious lack of foot traffic, it feels like a spot you’d tumble into after a long day in the island surf. Honolulu natives Sam Bonsey and Josiah Bonsey run the colorful little counter-service restaurant, where you order scoops of ever-changing fresh fish, maybe topped with avocado, pickled onions, or macadamia nuts, best eaten at one of the handful of tables. Prefer dry land? Ask for a plate of fried chicken and a scoop of “mac salad.” Portions are big. So are the good vibes. “Have you ever tried poke before? Would you like a sample?” asks a smiling staffer at Poke City, outside Porter Square. It’s easy to get overwhelmed, so the warm greeting is appreciated. The pleasure here comes from creativity. Design your own meal by ordering assembly-line style from a dazzling array of proteins, mix-ins, and sauces — spicy salmon with sriracha aioli? surf clam with pineapple salsa? — and enjoy. If you’re making a dubious decision, someone will gently steer you to safety. 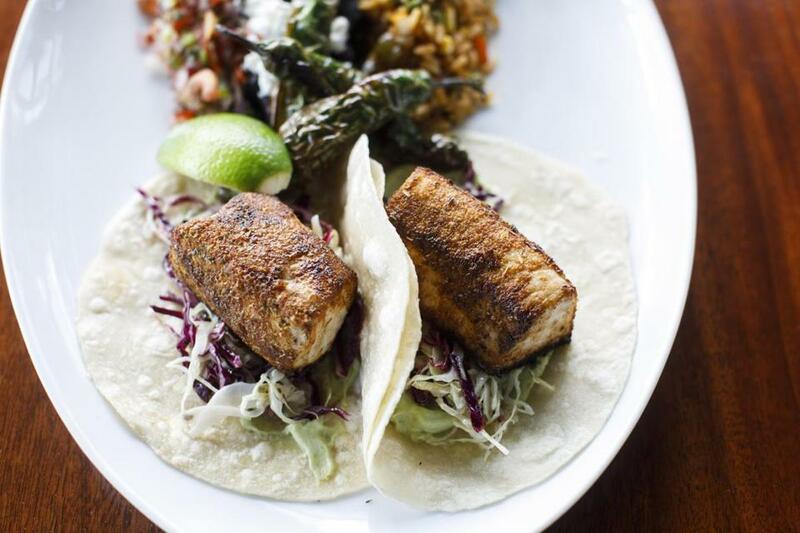 New restaurants seem to arrive daily in the Seaport and Fort Point. Goodbye, Anthony’s Pier 4; hello, high-end dining. If you find yourself in the area, trust these places to feed you right. There should be a word for the unique form of happiness that results when a favorite food, previously available largely through pop-ups, gets a brick-and-mortar location. 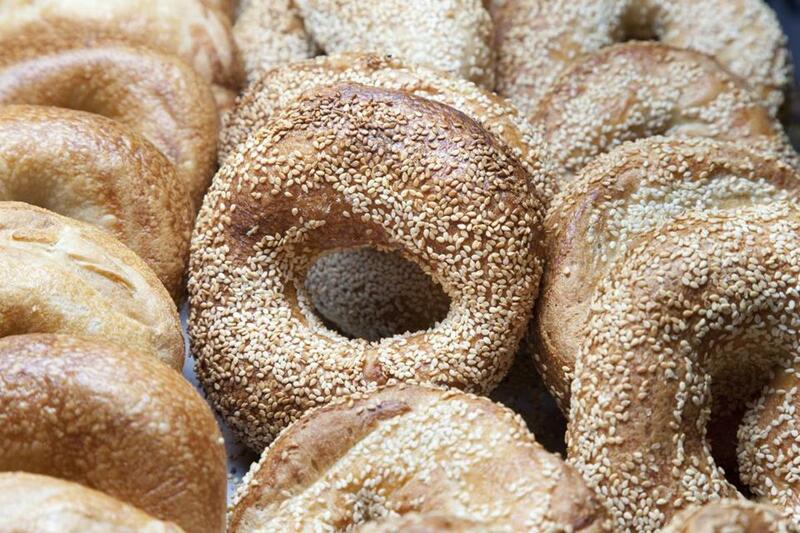 That’s what happened with Better Bagels, bringing New York-ish salt, everything, and cinnamon raisin to the Seaport. They come with cream cheese and lox as well as in sandwich form, from the classic egg and cheese to smoked turkey with chipotle mayo and hummus with veggies. Breakfast and lunch just got better for those who live and work in the area. Glitz, glamour, big hair, big jewels, big spending — it’s 1986 all over again at the Seaport location of this outsized steak-and-seafood chain. Tuck into a massive shellfish tower, wrap your manicured mitts around an ice-cold martini, and listen to some live music while wooing your date, hustling a client, or celebrating that big bonus. Mastro’s is unabashedly swanky, from the caviar to the bathroom attendant (yes, there’s a bathroom attendant) to the sticker-shock prices. Toast your good fortune and enjoy the harbor view. Amiable Oak + Rowan, in Fort Point, feels like a friendly neighborhood restaurant with a menu that aims for the heights. Chef Justin Shoults serves beautifully composed cheese plates, caviar with traditional accompaniments, craveable pasta dishes (cocoa pappardelle with wild boar ragout; spaghetti with lobster, uni, ham, and cured egg), and venison osso buco, while pastry chef Brian Mercury straddles the line between homey and experimental with the likes of buttermilk date cake with rooibos, labneh, and long pepper meringue. 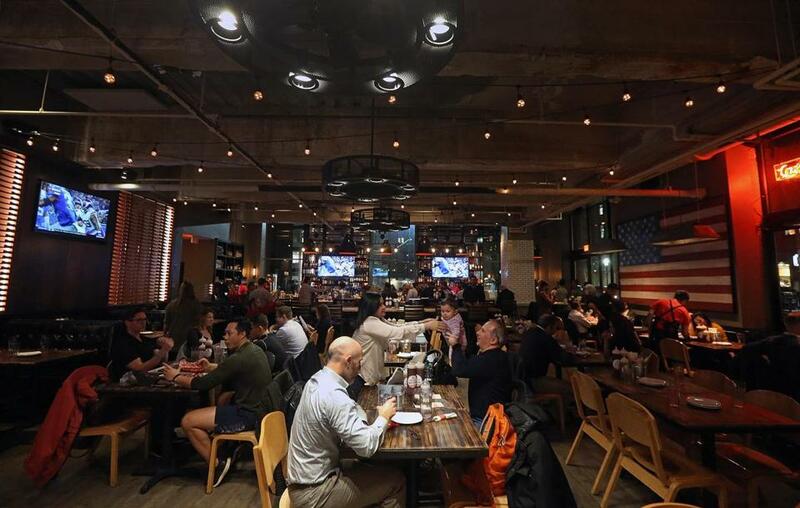 Pit master Andy Husbands has expanded his Kendall Square barbecue parlor to Fort Point’s old Tavern Road space with great success. Southern rock on the speakers, stiff whiskey at the bar, tender ribs and brisket, and pimento mac and cheese that would make your physician weep with horror (or envy). Husbands brings an authentic, affordable splash of smoky spice to an area rife with big-ticket dining rooms and fast-casual chains. Try the smooth, creamy sweet potato mash: It’s almost as good as ice cream. It’s huge (14,000 square feet). It’s open for lunch and dinner. It has a crowd-pleasing Italian menu, classy neutral decor, a fireplace, and a gelato bar. It’s quiet enough for an actual conversation over hand-stretched mozzarella, rigatoni alla Bolognese, and pollo al mattone. 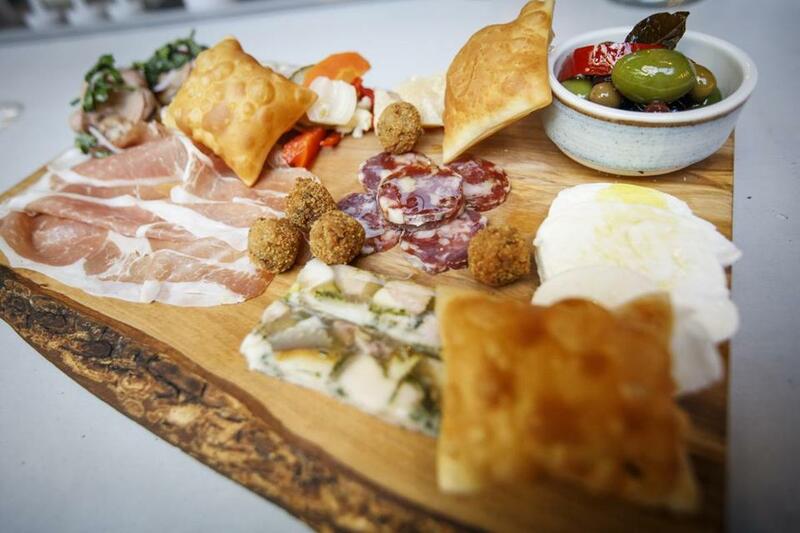 Restaurateur Joe Faro’s Tuscan Kitchen — with branches in Burlington and New Hampshire — instantly upped everyone’s game in the battle for Seaport business lunches and post-work gatherings.